Since this will be our first married Christmas where we will actually spend the holiday in our own home, we decided that it would be fun to go and pick out a live tree. Honestly, this place didn't have much of a selection of "traditional" Christmas trees. But we don't have room for a huge tree anyway so we picked out a cute little spindly one. 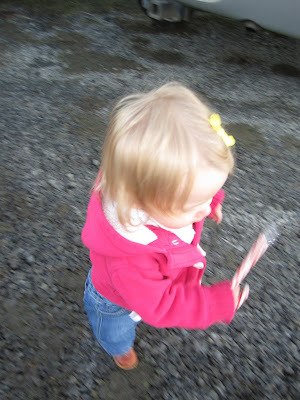 On our way out, one of the workers gave Kenley a candy cane. 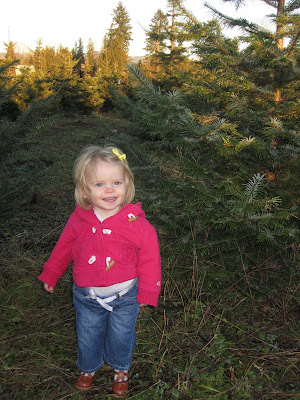 She was so excited so we just let her hold onto it for the car ride from the tree farm to Gramma and Grandpas... Big mistake! She opened it and got sticky candy cane all over herself and the carseat. I finally put the lights on the tree today and hopefully we can get around to the ornaments sometime this week!